We left San Diego early Thursday morning and drove out through the Imperial Valley. If you're not familiar, it's an enormous agricultural scene down there in what would otherwise be a desert wasteland (courtesy of water diverted from the Colorado River). We saw miles and miles of hay, stacked so neatly and high that from a distance, it looked like buildings out in the fields. Part of the drive we were only a stone's throw from Mexico, and saw the border fence that has been built in some places. We also saw pastures of sheep, sand dunes, and a stand of wind mills. From there we cut through Phoenix and up through Payson on our way back to Winslow. Payson is where the author Zane Grey lived in his log cabin. (The cabin burned down some years back, so I don't know what is there now.) As we climbed out of Phoenix, we started seeing the saguaro cactus, indigenous to the Sonoran desert. 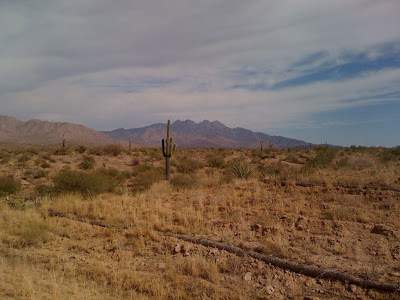 Many of us envision the saguaro when we think of a desert scene. 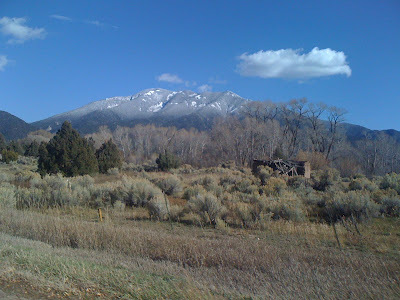 We arrived in Taos late yesterday afternoon and discovered some snow on our local mountains. Traditionally we assume we'll get our first snow on Halloween (down at our elevation, that is)...so this week is time to get the rest of the firewood up to the house and be ready. Pretty scenery Martie! Glad you didn't have to drive in snow though. I think winter's coming early to lots of places this year!